What is the best way to provide feedback to your players? There are several different ways to provide feedback to your player. Below you will see that your can use verbal and visual cues to give the best feedback possible. cue a player to move properly, you need to understand the difference between internal and external cues. Internal cues focus a player internally on their body movements. External cues focus a player externally on the results of the movement. External cues have proven in research to be far superior to internal cues when coaching movement. Below are two tables with examples of both internal and external cues. Use external cues to improve your players’ movement. Another method to train movement is to use visual demonstrations of the proper movement. The demonstration can be done by a novice or an expert. Expert models show the ideal movement while initial novice models help player’s identify movement errors. 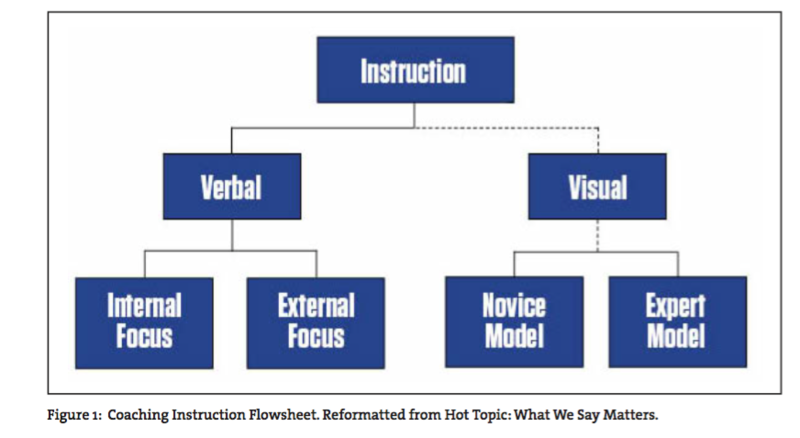 Motor learning research has shown that both novice and expert modeling are effective in teaching movement. It is recommended when you first teach a movement to use an expert model. Once the players become familiar with the “ideal” movement pattern you can begin to shift their focus onto each other to identify and movement errors. For example, show a video of a proper squat then put your players in partners and have them analyze each other’s squats for movement errors. As you can see from the diagram above, both visual and verbal cueing can be used to achieve your desired results with you soccer players. 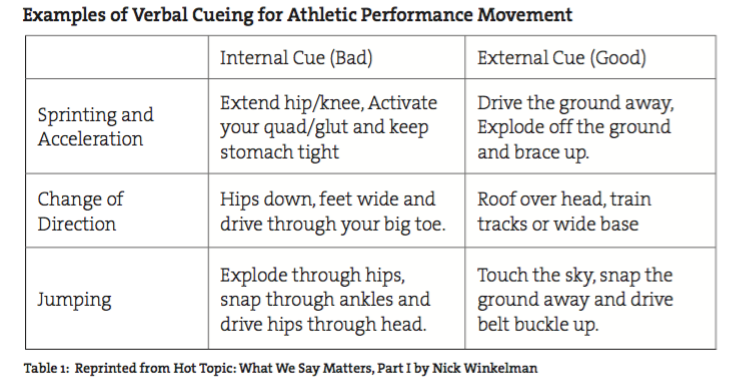 Of course you can use it to improve their game, but next time, try to use these cues to improve their movements on the field. 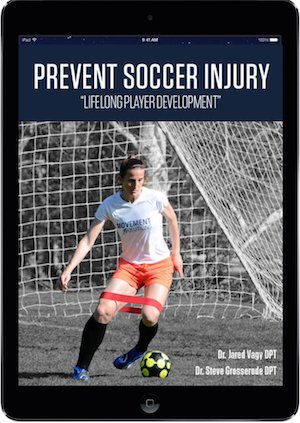 This will help them learn to move with alignment and can prevent soccer injuries from occurring.